. @phil_hellmuth won the 2012 WSOP Europe Main Event. He recalls a hand that helped propel him to the title. It's the hand that put you over the top. Or the two cards you held that time you were rivered for a monster pot. Everyone has "the hand," that one that you remember no matter how many more tournaments or cash games played. PokerNews takes a look at those hands that stick with players and relive the glory, or misery, depending on the results. 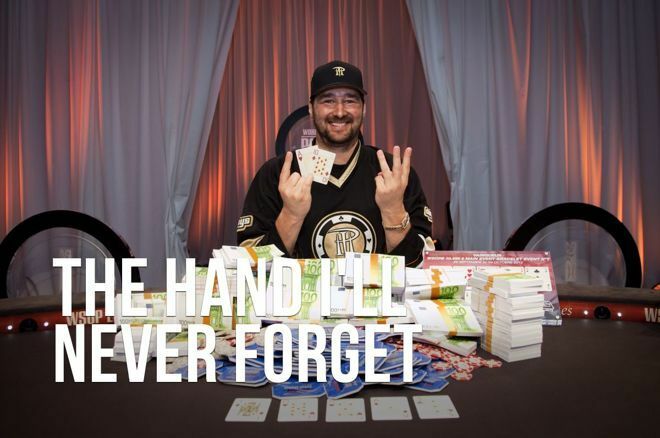 Phil Hellmuth recently recalled about a memorable hand that led to some big dividends for the Poker Brat. 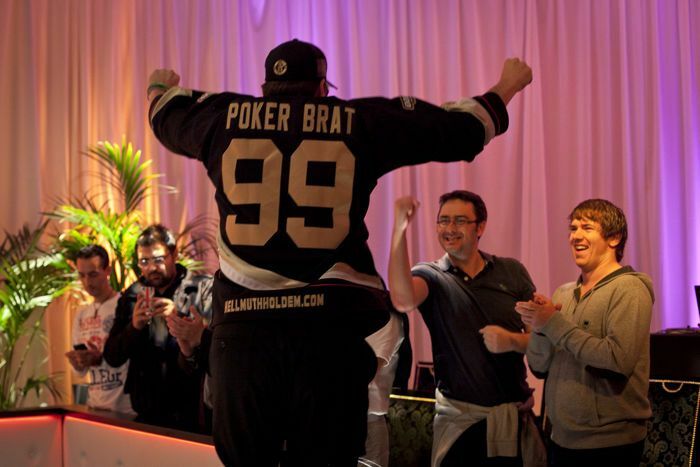 It was a massive year for Hellmuth in 2012. The summer brought his 12th bracelet at the WSOP in Las Vegas in the the $2,500 Seven-Card Razz event for $182,793. He had shaken off some criticism by winning his first non-hold'em event (he'd also win the $10,000 Seven-Card Razz event in 2015), and was looking for more at the 2012 WSOP-Europe in France. After surviving a field of 417 other players, Hellmuth found himself four-handed with France's Stephane Albertini, California's Joseph Cheong, and Ukrainian Sergei Baranov, who only days earlier had successfully predicted the two men would be playing heads-up for the championship, according to Hellmuth. A key hand would develop to propel Hellmuth to the title (and indeed to Baranov's predicted result). With blinds at 25,000/50,000 and antes of 5,000, Cheong folded from under the gun and Albertini raised to 100,000 from the button. Baranov then re-raised to 200,000 from the small blind. Hellmuth called in the big blind, and Albertini also called. The flop brought and Baranov fired 275,000. Hellmuth called and Albertini folded, bringing the the on the turn. Baranov then bet 500,000 and Hellmuth again made a quick call. The river was the and the Ukrainian continued with the aggression, moving 1 million chips into the pot. Hellmuth tanked with a massive decision to make. "In the booth, Antonio Esfandiari thought Sergei had it." "You got lucky again?" Hellmuth said to Baranov at the time. "Either that or you're trying to bluff off all your money again. This is so sick. Jacks any good? Sergei? Can you beat jacks?" With just over 4 million chips at the time, a loss would siphon off a big percent of his chip stack. With a WSOP-E Main Event title in sight, the hand would be one of the biggest of the tournament for the 14-time WSOP champion. The two had been locked in battle often with several big pots. "At this point I could only beat a pure bluff," Hellmuth says. "I studied, and considered folding. If I called, and was wrong, then I was going to be a short stack. If I folded, then I had enough to come back and win. A call was risky because if I was wrong then I would finish in fourth place – and Sergei was super likely to have me beat. He raised before the flop, and bet big every street. It's rare to have someone fire four streets like that with nothing. In the booth, Antonio Esfandiari thought Sergei had it." After studying his opponent and considering his options, Hellmuth's instincts proved to be in top form. "After four minutes, I found a call," he says. "Sergei said, 'You win,' and i triumphantly flipped my pocket jacks face up ( ) and shouted, 'Yes!' Now I had a big chip lead, and I aimed to win it. I truly played one of the best tournaments of my life, and I actually won it. It doesn't always happen in my profession. I was very thankful." Hellmuth remembers another big hand from earlier in the tournament when a player on the button raised and he just called with in the big blind. While he doesn't recall the exact specifics of the hand, the flop came . His opponent held , and Hellmuth was able to fold after a bet on the flop from the other player. "Even though I had a massive chip lead, I somehow knew that he had it, and trusted my instincts," he says. "Whew, white magic! Reads!" Hellmuth went on to take the title, the 13th of his 14 bracelets. He notched a score of €1,022,376 ($1.35 million) and some major prestige as the first player to win the Main Event in Las Vegas and in Europe. "It was a huge win for my career!" Hellmuth says. "First, to win my first non-hold'em WSOP bracelet earlier in the year was huge, then to back it up w one of the most prestigious bracelets – the most prestigious WSOPE bracelet – was amazing! After three second-place finishes in 2011 at the WSOP, to come back with two wins let the world know that not only hadn't I faded, but that I was the hottest player on the planet in 2011-12."